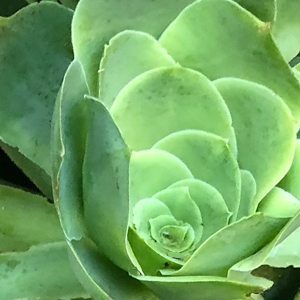 A large growing succulent, Aeonium canariense makes a great feature plant and grows equally well in the garden and containers. New foliage emerges a good green with a slight indumentum. Over time they will either stay green if grown in shade, or develop a red tinge in sun. The more sun the plant receives the more red the foliage will become. The flowers are a creamy yellow and are a great feature. One of the common names, tree aeonium, comes from the bare stems that will form over time. More widely known for the many hybrids, this is still a great garden plant. This is an easy species to grow as long as the soil is well drained. It is drought tolerant, however in dry summers some extra water will be beneficial. This is a summer dormant plant, active growth is in the cooler months. Easy from stem cutting and also possible by removing offsets. Common Names – Giant Velvet Rose, Tree Aeonium, Canary Island Aeonium. Foliage – Large green rosettes, in full sun they may take on a red tinge..